Sandy King holds a Ph.D. in Spanish Literature from Louisiana State University. He is Professor Emeritus of Languages from Clemson University and currently resides in Easley, South Carolina. Sandy is a photo historian and the author of several books on the pictorial movement in Spanish photography, including: The Photographic Impressionists of Spain: A History of the Aesthetics and Technique of Pictorial Photography, Schmidt de las Heras: Fotografías 1944-1960, and El impresionismo fotográfico en España: Una historia de la técnica y de la estética de la fotografía pictorialista, Zarautz (Spain), 2000. 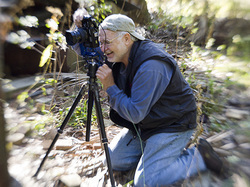 Sandy prints primarily with alternative processes, including carbon, kallitype, and palladium, and has published numerous articles in both print and on-line sources, including portfolios in Photovison, Silvershotz and View Camera. He has conducted numerous workshops on carbon printing in the USA and abroad, and is the author of The Book of Carbon and Carbro: Contemporary Procedures for Monochrome Pigment Printmaking, 2002. My objective as a photographer is to capture images that express the timeless. I am interested in the natural landscape as an abstraction of reality and I print in monochrome because it abstracts reality and allows one to concentrate on light, form and texture. Printmaking is as important to me as seeing and discovery. Most of my work is done with hand made photographic processes, including carbon transfer and platinum and palladium. Being a part of the Ossabaw Artists Collective has been rewarding both personally and professionally, for the new friends I have made and for the opportunity to spend time and photograph on the beautiful Ossabaw barrier island. I hope that my work will convey to others the beauty of the place, and to preserve as much of it as possible for future generations.